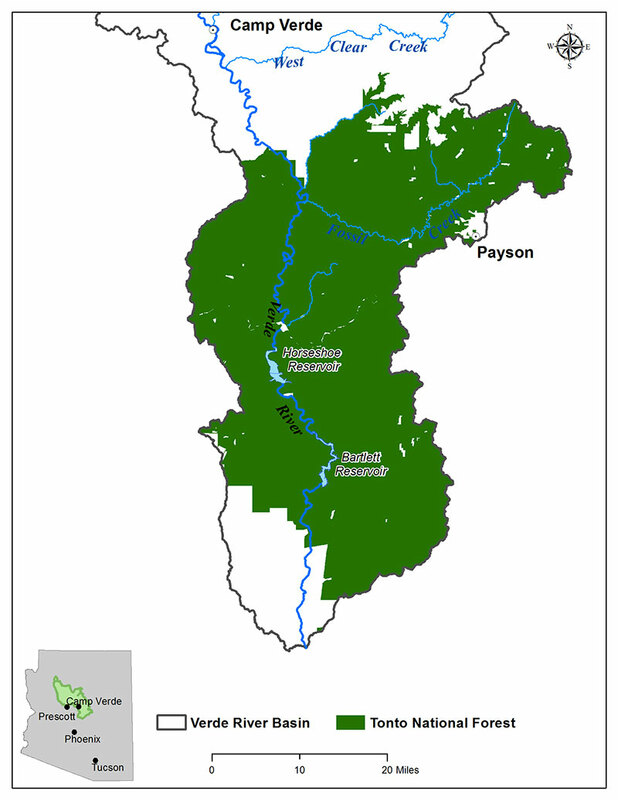 Map of Tonto National Forest boundary. Map Credit: The Nature Conservancy. The lowest reaches of the Verde River pass into the 3 million acre Tonto National Forest (TNF), the fifth largest national forest in the nation. Lying on the outskirts of one of the largest urban metro areas in the desert Southwest, the TNF receives nearly 6 million recreational visitors per year. The TNF was established at the turn of the 20th century in large part to protect the watersheds and reservoirs that provide drinking water to the Phoenix metro area. The TNF includes eight wilderness areas that total nearly 600,000 acres. These include Four Peaks Wilderness Area; Salt River Canyon Wilderness Area; and the Mazatzal Wilderness Area, where the Verde River Wild & Scenic stretch flows after leaving the middle reach in the Verde Valley. There are six reservoirs on the TNF, with the capacity to store over 2 million acre-feet of water. The major reservoirs that contain the Verde River – Horseshoe Reservoir and Bartlett Lake – store water both for irrigated agriculture and drinking water in the Phoenix metro area. The TNF, in addition to being a recreational mecca for urban residents in the Phoenix area, also supports a variety of traditional uses, such as livestock grazing and timber harvesting. The reservoirs at the lower reaches of the Verde River are used for a host of water-related recreation activities such as fishing, boating, swimming, and water-skiing. To learn more about the TNF, please visit its web site here.